This artist's impression shows hot gas orbiting in a disk around a rapidly-spinning black hole. The elongated spot depicts an X-ray-bright region in the disk, which allows the spin of the black hole to be estimated. On Nov. 22, 2014, astronomers spotted a rare event in the night sky: A supermassive black hole at the center of a galaxy, nearly 300 million light years from Earth, ripping apart a passing star. The event, known as a tidal disruption flare, for the black hole's massive tidal pull that tears a star apart, created a burst of X-ray activity near the center of the galaxy. Since then, a host of observatories have trained their sights on the event, in hopes of learning more about how black holes feed. Now researchers at MIT and elsewhere have pored through data from multiple telescopes' observations of the event, and discovered a curiously intense, stable, and periodic pulse, or signal, of X-rays, across all datasets. The signal appears to emanate from an area very close to the black hole's event horizon -- the point beyond which material is swallowed inescapably by the black hole. The signal appears to periodically brighten and fade every 131 seconds, and persists over at least 450 days. The researchers believe that whatever is emitting the periodic signal must be orbiting the black hole, just outside the event horizon, near the Innermost Stable Circular Orbit, or ISCO -- the smallest orbit in which a particle can safely travel around a black hole. Given the signal's stable proximity to the black hole, and the black hole's mass, which researchers previously estimated to be about 1 million times that of the sun, the team has calculated that the black hole is spinning at about 50 percent the speed of light. The findings, reported today in the journal Science, are the first demonstration of a tidal disruption flare being used to estimate a black hole's spin. 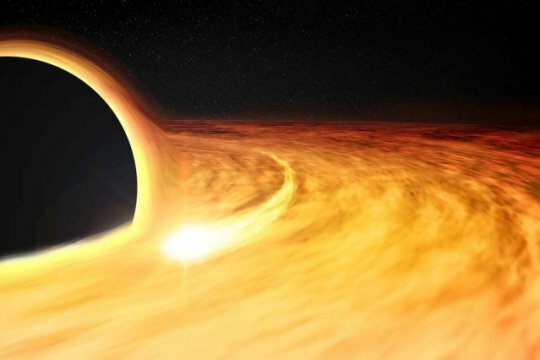 The study's first author, Dheeraj Pasham, a postdoc in MIT's Kavli Institute for Astrophysics and Space Research, says that most supermassive black holes are dormant and don't usually emit much in the way of X-ray radiation. Only occasionally will they release a burst of activity, such as when stars get close enough for black holes to devour them. Now he says that, given the team's results, such tidal disruption flares can be used to estimate the spin of supermassive black holes -- a characteristic that has been, up until now, incredibly tricky to pin down. "Events where black holes shred stars that come too close to them could help us map out the spins of several supermassive black holes that are dormant and otherwise hidden at the centers of galaxies," Pasham says. "This could ultimately help us understand how galaxies evolved over cosmic time." Pasham's co-authors include Ronald Remillard, Jeroen Homan, Deepto Chakrabarty, Frederick Baganoff, and James Steiner of MIT; Alessia Franchini at the University of Nevada; Chris Fragile of the College of Charleston; Nicholas Stone of Columbia University; Eric Coughlin of the University of California at Berkeley; and Nishanth Pasham, of Sunnyvale, California.